FULLY WORKING, NO FAILING LED'S REQUIRES NEW PLUG TO BE FITTED TO CABLE AS I HAD ALL THESE PLUGGED INTO A JUNCTION BOX. BLUE / WHITE LED'S. I HAVE 3 TMC TILES FOR SALE IN TOTAL - PLEASE SEE OTHER AUCTIONS. The TMC AquaBeam 1000 HD Ultra Marine (without Power Controller) is the next step in efficient and effective aquarium lighting. The LEDs come in a sealed water-resistant casing and are the ideal alternative to fluorescent lighting. 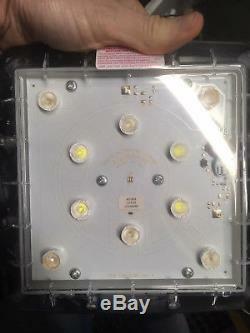 LED lighting has a minimum lamp life of 50,000 hours and is a cheaper and much more energy efficient lighting method. It also penetrates the water in a way that produces that shimmering effect and promotes the colours of the water and coral. This lamp also provides the essential photosynthetic light that your corals need in order to thrive. The AquaBeam 1000 HD Ultra Marine offers a versatile, compact design and is even suitable for installation into aquarium hoods. It includes heavy-duty metal mounting fixtures which make it suitable for use on a wide variety of aquariums and is even wall mountable. This model is also compatible with the Aquabeam Power Controller, which can be bought seperately. At a glance: Suitable as an alternative to fluorescent lighting Very compact - just 20 x 20cm - and suitable for all aquarium types including nano and other smaller tanks Marine White LED lighting including ten 14,000K white LEDs and three 50,000K blue LEDs Cool running with low heat transfer to aquarium water reducing the need for expensive cooling systems Suitable for installation in aquarium hoods Versatile mounting fixtures included, allowing a wide variety of replacement, retrofit and new install options on all sizes of aquaria Sealed, water-resistant casing and a low DC voltage power supply. 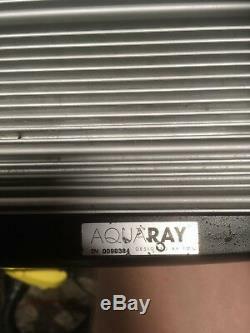 The item "TMC AquaRay AquaBeam 1000HD Marine LED Light Reef Coral Aquarium Lighting AUC 1" is in sale since Monday, January 7, 2019. This item is in the category "Pet Supplies\Fish & Aquarium\Lighting & Hoods". The seller is "anemone_dan" and is located in Stoke-on-Trent. This item can be shipped to United Kingdom, Austria, Belgium, Bulgaria, Croatia, Cyprus, Czech republic, Denmark, Estonia, Finland, France, Germany, Greece, Hungary, Ireland, Italy, Latvia, Lithuania, Luxembourg, Malta, Netherlands, Poland, Portugal, Romania, Slovakia, Slovenia, Spain, Sweden, Australia, United States, Canada, Japan, New Zealand, China, Israel, Hong Kong, Norway, Indonesia, Malaysia, Mexico, Singapore, South Korea, Switzerland, Taiwan, Thailand, Chile.